Convocation 2016 - "To Empower A Community of Learners Who Will Change the World". My message had two main parts - the world-changing role of teachers, aides and public education in general in our society and what specifically it means to change the world. The opportunity to provide this message is one of highlights of my time on Worthington's Board. It was an opportunity to take a step back from the day to day, week to week routine of serving on a Board of Education and focus on what the heck we are really doing here. Here's the speech. Good Morning. My name is Marc Schare and I have the honor of serving as the President of the Worthington Board of Education this year. I’ll start my remarks with a bit of a confession. I’m really not one for corporate mission/vision statements. In my experience in corporate America, large companies spend a lot of time creating an utterly meaningless statement that is forgotten as soon as it is introduced. Still, when our new Superintendent told our board that he wanted to go through yet another visioning process, I thought it was harmless. A few months went by and I didn’t really think much more about it. Dr. Bowers would send the Board updates periodically and a few of us went to a few of the community meetings and finally, one cold day last February, Trent sends an email announcing the mission statement. What an audacious goal, I thought. Aspirational to be sure. Thought provoking? Absolutely! But seriously, as my inner voice debated with itself – how many Worthington students will, in the fullness of time, change the world and what does that even mean. Ultimately, I decided that it was not only meaningful, not only actionable but absolutely essential to what we do here and I thought I’d take my allotment of time to opine why this mission statement, unlike so many others in corporate America, should be taken seriously as a foundational, governing document. To do so, I thought I would channel my inner “Trent Bowers” and tell you a story. I went to small, private high school on Staten Island in New York and didn’t have any real opportunities to explore career options until I was a freshman in college. My first year, I signed up for mostly introductory classes at my community college turned 4-year school because that’s what you did in the 70’s but there were really only two classes that I was looking forward to. The first, and I know this is going to shock you, was Politics 101 and the other was Computer Science 101. I had zero exposure to either area before college since my high school offered neither. In my political science class, from day one until day whatever, the professor stood in front of the classroom literally reading the textbook to us. There was no inspiration, no passion, little discussion and he didn’t care if you showed up or not, and this was in the middle of the Presidential Campaign between Jimmy Carter and Gerald Ford. I did poorly on the final examination despite getting every answer correct because I missed the instruction in the beginning that said I needed to write in complete sentences so although I knew that Carl Albert was the Speaker of the House, since I didn’t write “Carl Albert is the Speaker of the House of Representatives”, I was marked wrong on every question and very nearly failed the class for that reason. I do not remember the instructor’s name, only that I swore I wasn’t going to take another class like that again. The next semester, I took Computer Science 101 and fell in love with it immediately. The professor was Mimi Tausner and she was able to take what for most was an incredibly dry subject and make it come alive for me. She was so inspirational that I did numerous extra credit assignments for her, including programming a horse race prediction program among other notable accomplishments that first year. Professor Tausner is the reason why I went into computer software as a profession and I’ve always thought that if Professor Tausner brought her passion to Politics 101 and Professor Politics brought his drudgery to Computer Science 101, my entire career and life would have been very, very different. Such is the power you, as teachers, hold in our society and it is an awesome power to literally change the direction of a student’s life in a few short months. But, does changing that life mean changing the world? Well. That brings me to Part 2 of my story. Fast forward 5 years and I was working in Bell Labs as a systems programmer working with really, really powerful mainframes. I noticed that we were doing all kinds of repetitive, operational tasks manually that could be done more accurately and more efficiently by the machine itself. A few years and a lot of 1am to 7am programming time later, the world’s first commercially available automated operations package for IBM mainframe computers was born. A few years after that, it and the competition it inspired was running in a thousand companies across the planet and changed the way that people thought about operating these large scale computers. I don’t know if that is a “change the world” story but I’m pretty sure it’s as a close as I’m going to get. One thing I know for certain is that it would not have happened if Professor Mimi Tausner didn’t spend time with an awkward 17 year old kid who had a really tough time in high school, never took an AP class or any advanced coursework for that matter, never took the SAT and yet somehow, she ignited a passion I didn’t know I had. Maybe I didn’t change the world, but she sure changed my world, an opportunity you will have every day throughout your careers as educators. The moral of my story, not to beat you over the head with it, is that you never, ever know what word, what action, what combination of events is going to inspire some student into performing some world-changing action. A few weeks ago, I had a long conversation, coincidentally, with a 20 something year old Worthington graduate who was expressing personal angst that he had not yet changed the world and accomplished something significant. Eventually, the conversation came around to exactly what “changing the world” means. Does it mean solving some intractable global problem like world hunger or clean water? Does it mean directly influencing global public policy? Does it mean you have to invent something that positively impacts the lives of millions of people? My answer is no, not necessarily. My fondest wish for our students is that armed with what you provide them, they go out into the world and, to the best of their ability, change *their* world in positive ways, whatever that might mean to the individual, and if it has some broader significance to our society, so much the better. Some of our students will change their world through good works afforded via financial success. Others will, I’m quite certain, achieve scientific breakthroughs (in fact, I saw one at last year’s science fair). Still others will be known locally, nationally or globally for their abilities in the arts but virtually everyone who walks through the door of one of our buildings this week will change the world as perceived by their parents, their relatives, their professional colleagues and later on, their children. How they do that is up to them, and you. I really believe that every single one of our students walking into each of your classrooms, getting on each of your buses, eating one of your lunches, playing on one of your teams or participating in one of your activities has the God given potential to change the world but it is up to you, teachers, aides, drivers, secretaries, custodians and administrators of the Worthington School District to find and ignite within that student the passion, drive and commitment necessary to maximize their own world-changing abilities, just like it was up to Professor Mimi Tausner to do so with me. No, I’m not one for corporate mission statements, but this one works for me because it so encapsulates why we are here, why you became educators, why I ran for the school board in the first place and how our district will ultimately be successful and how, honestly, that success should be measured. On behalf of the Board of Education, thank you for your attention, we look forward with you to the start of the school year and most of all, we wish you Godspeed in your mission to empower a community of learners who will change the world. The State of Ohio has not had a school funding formula last more than just a few years in quite some time. Every 2 years seems to bring us another biennial budget with its share of winners and losers as the formula is changed. 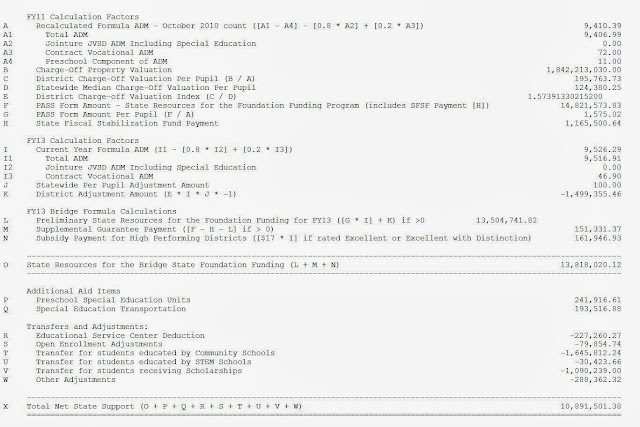 While the legislature and the Ohio Department of Education produce simulations, conservative treasurers will always wait until the money starts flowing before incorporating the numbers into projections. For this cycle, that first payment happened last week and the financial news appears to continue to be very good for Worthington. Here are the summaries. The first is from the "Bridge" report that detailed our state foundation funding and deductions from 2011. The second is from the new funding report in October of 2013. To be sure, these are unofficial projections based solely on the data from ODE. Our Treasurer will be updating the Board with his official projections later this month. The numbers will be vetted through the Treasurer's Advisory Committee at a meeting on October 21 and be the main topic of the Board Meeting on October 28. Unofficially, though, this is a difference to the bottom line of $1,045,010 for the first year. That's a little over a million dollars a year of unanticipated revenue that can be use for programmatic expansion or saved for a rainy day. Please note that these funds are over and above the funds that Worthington will receive from the permanent reimbursement of the Tangible Personal Property Tax now ensconced in state law. The news gets even better! Worthington's state foundation funding was "Capped Out". The state, in an attempt to conserve funds, ruled that no school district would receive more than a 6.25% increase between this year and last year, even if it would receive more funds under the formula. As you can see from the second chart, the calculated formula number is closer to $19,000,000. Since the cap is 10.5% in the second year of the biennium, Worthington should receive another increase for the 2014-2015 school year. All of this good news is why I continue to believe we will have sufficient revenue (again, assuming current state law is maintained with regard to TPP reimbursements) to extend the 2012 levy until at least 2017 and maybe 2018 while also having sufficient funds for programmatic expansion such as the reintroduction of a foreign language program in the elementary grades. In November of 2012, Worthington City School district residents passed an incremental operating levy. Our district had made a case that reductions at the state level, particularly in regard to tangible personal property tax reimbursements, were going to result in a significant funding drop which, if quality was to be maintained, would have to be restored at the local level. At the time, it was a perfectly valid assumption. In fact, prior to voting to place the levy on the ballot, State Representative Mike Duffey had arranged a conference call between me and the chairman of the Ohio House Budget Committee, and Chairman Amstutz told me directly that it was more likely than not that Worthington's TPP revenue from the state would be phased out. 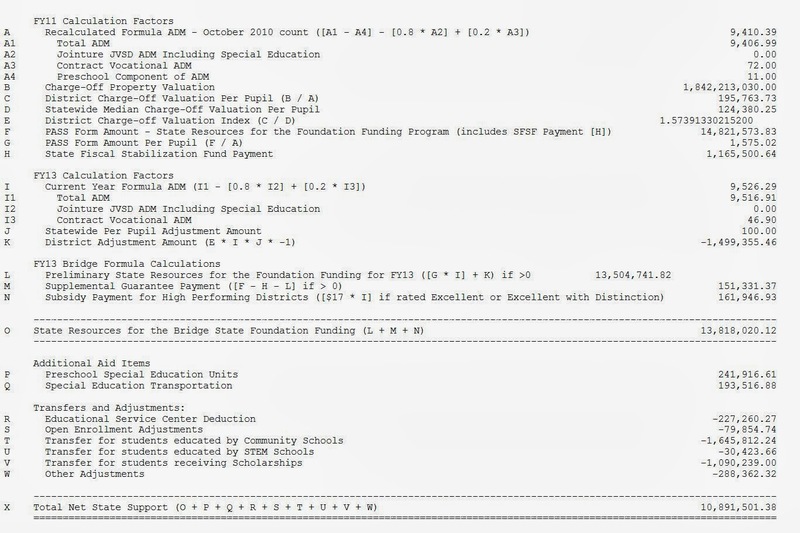 In addition, we made some other assumptions in advance of placing that levy on the ballot. We assumed there would be no retirements from the Worthington School District, or, more correctly, we conservatively did not include those in the forecast used to determine the levy amount. We also forecasted some steep increases in employee health care costs. Fast forward a year. The levy has passed and, in the fullness of time, we now know how our assumptions panned out. TPP Reimbursements were not phased out and current state law says that they are not going to be phased out. Assuming state law is not changed, this will result in 22.2 million dollars of unforecasted revenue to the district in the next 4 years, and approximately 10 million dollars a year after that. We had over 100 certified staff retire. This will result in considerable savings each year. In fact, our average teacher salary dropped $2,500 in the last year alone. We are anticipating around $400K/year in casino money. That money was not yet forecasted when we determined the levy amount. Our health care renewal rate was forecasted to be 13%. Because of our lower-than-expected claims experience, it turned out to be 3.56%. Now, it is time to do some long term financial planning. When will the Worthington School District have to run another levy. First, let's figure out where we are. If you want to know when the next Worthington levy will be required, you must first calculate a target cash balance that you want to maintain at all times. The Government Finance Officers Association (GFOA) recommends 60 days of expenditures while the credit agencies say that 5% is fine. We'll go with GFOA for the purpose of this exercise. Once we find the first year when we no longer have that 60 days of operating expenses in the bank, the rule of thumb is that we back it up 2 years and that would be the year that we need to run the next levy. So, with all the good financial news, let's get to work calculating when that next levy might be required. For the purposes of this exercise, I am going to be really, really conservative and only use the TPP reimbursements as a modification to the forecast that was passed in May of 2013. If we do this, we would take the ending cash balance at FY17 in the lower right hand corner of the link, which is 24.3 million dollars and add the 22.2 million dollars above, giving us a total of 46.5 million dollars. This is above our rule of thumb, so no levy is required in 2015. Since this forecast only runs through 2017, we need to approximate what other years of the forecast might look like. Being ultra conservative, we anticipate virtually no new revenue from anywhere (note: the treasurer does assume a small amount of incremental revenue from "inside millage") and we anticipate expense growth at the projected rate in 2017, which is 3.2%. Let's do that for three additional years, FY18, FY19 and FY20. When we do this, we get a very rough forecast that looks like this. The resulting forecast has a chart showing the following ending cash balances. The blue line represents the projected end-of-year cash balances assuming the state keeps its hands off of our TPP reimbursement revenue and that we keep expenses growing at a modest rate of about 3.2% after 2017, or roughly 150% of the current inflation rate. Last year, when voting to put the levy on the ballot, I proposed making a promise to the taxpayer that if TPP reimbursements did continue at a pace higher than that forecasted, the Board and the administration make a commitment to save those dollars and put them towards extending the life of this levy. The board did not want to entertain such a promise at that time, but I want to renew that proposal, and here is why. Voters in Worthington agreed to provide our district with additional operating funds because the district told them that the state was severely cutting our funding. That message was in virtually every levy communication, and rightly so. Had the state actually cut our funding and without the levy funds, it would have been a scary proposition. In fact, the district said in numerous forums that we would have to cut 10 million dollars out of the budget over the next several years. In the fullness of time, we now know that the state funding wasn't cut, so the question becomes: What should the Worthington School District do with the windfall? In my opinion, the right thing to do is to honor that campaign message, preserve the bulk of those funds, and extend the length of this levy. So how do we make that happen? If there is one observation I’d make about government at all levels, Republicans, Democrats and everyone in between, if you’ve got money, you spend money. It’s human nature. That’s why I believe that if extending the life of this levy is to be a management objective, it must be stated as such and management must be held accountable for the results. The primary vehicle the Board Of Education has to hold administration accountable for results is through the Ohio Superintendent Evaluation System. OSES provides for a set of goals for the Superintendent to accomplish each year. At the August 26, 2013 BOE meeting, I proposed that one of the goals be in the area of resource management that, simply stated, the district be managed in such a way as to not require an operating levy until 2018. The annual, measurable objective (part of OSES) would be to maintain a sufficient cash balance and five year forecast consistent with that goal. Obviously, it is a long time between now and 2018 and many things can happen. The goal would have to make allowances for unexpected events. The state could decide tomorrow to cut our funding in half, or issue a series of unfunded mandates. Goals are not meant to be completely inflexible, only to publicly express intentions. I also want to emphasize the point that this goal does not mean we won't have money for new initiatives. Quite the opposite. Remember, this calculation only includes TPP reimbursements. We have savings from retirements and much lower then expected health care costs, we have revenue from casino operations and ODE is estimating an additional 1 million dollars a year in state aid that we can use towards new programming. We are applying for grants from the Ohio's new "Straight 'A' fund". We also have bond money for technology capital equipment purchases. The intent of the goal is not to starve the district of needed revenue, it is merely to state an intention that since the assumptions we documented vis-a-vis state funding to pass the levy in 2012 turned out inaccurate, we use some of the difference to extend the life of the levy, and 2018 is where the math says it would end up using the same rule of thumb that we've used in past levy cycles. On Monday, September 23, the Board of Education will discuss and perhaps vote on the goals. The resource management goal, as written, is to extend the life of the levy until (at least) November of 2017. Whether we ultimately wind up agreeing on 2018, 2017 or 2019, the important thing is the philosophy of preserving the unanticipated TPP reimbursement revenues to give Worthington taxpayers a respite from the 3 year levy cycle. By doing so, we have the opportunity to maintain credibility with our constituents and preserve the hard-won trust of our taxpayers, trust that will be necessary the next time we come to voters with a levy request. That's why I pushed for the resource management goal this year and that's why I will be supporting it on Monday.